I'm running Windows XP. When my nephew built my computer, he installed my old hard drive in addition to my new one. The computer changed the drive assignments at that time with the old hard drive becoming "C:" and the new becoming "F:". Since that time we've removed the old "C:" hard drive and the only hard drive remains as "F:". Now, some downloads won't install because they want a C: path, and various other functions trying to utilize drive C: have problems. Drive Management will not let me reassign my F Drive to C because it is the main boot drive. What can I do? Most people don't realize that using "C:" as the primary drive on your computer is fairly arbitrary. It's a good practice, if only to avoid the problems you're running into, but as you've seen you don't need to have it that way. You can build a system that boots from a drive of a different letter - in your case "F:". Unfortunately, some software packages don't realize it either. They assume that there'll always be a "C:". So we need to get tricky. First of all, reassigning the drive letter of your existing boot drive - changing the F: to C: - wouldn't work anyway. The problem is that all the software you have installed so far has been installed on F:. As a result, all the settings for that software assume (correctly) that F: exists, and that's where the programs can find what they need. One of those programs, by the way, is Windows itself. So if you simply renamed F: to C:, it's likely that the system wouldn't even boot, because Windows would still be looking for things on F: - the F: that was no longer there. Even if Windows did boot, most of the applications you have installed would also no longer work, for much the same reason. What I'm going to suggest is that we create a new C: drive, a "virtual" C: drive, on your existing hard disk. We'll use a fairly obscure tool that a lot of folks don't even know about, called "SUBST". 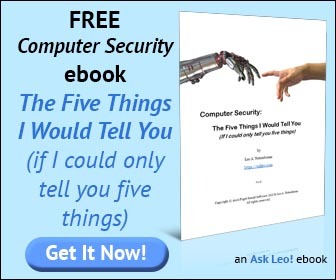 Except that you'll see your user name instead of mine, LeoN, and the drive will be F: instead of the C:..
You should now have an empty C: drive. It just happens to also be the contents of the directory f:\Virtual_C. Try some of the applications that you're having trouble with, and see if they now work, or at least behave differently. They may still fail, because our C: is empty - they might expect more than just the drive - but it's a start. The C: drive that we created will disappear when you reboot. (The contents will still be there as F:\Virtual_C, but the C: drive will no longer exist.) To make it automatic, we need to add a command to your startup group. 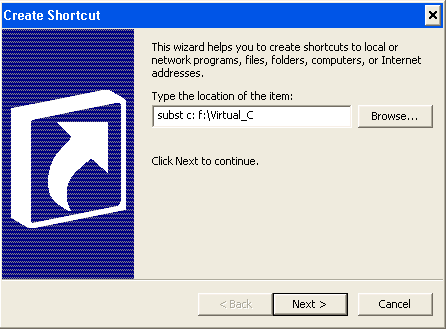 In the resulting dialog box, enter the "Subst" command we used earlier: "SUBST C: F:\Virtual_C". Click Next, and click Finish, and now each time you login, the virtual drive C: will be mapped to the F:\Virtual_C directory. As a final note, this entire scenario results simply because the old drive was added to the system and allowed to be "C:". As I said, drive letters are arbitrary, but by now you can see that "C:" is kinda special, even though it really shouldn't be. 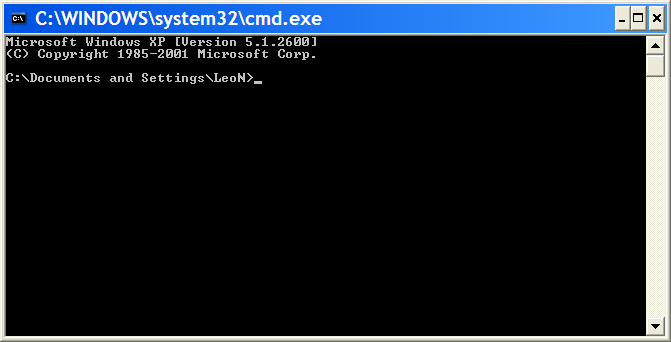 If you can, it's safest to install your operating system and boot from "C:". Typically that means when you add a new drive that you expect to boot from, make it "C:", and give the OLD drive a new drive letter. This allows you to safely copy data off of the old drive, and eventually remove it without any ill effect. Couldn't you just do a share with the name "C:" ? Assuming that you have file and printer sharing turned on, then sure, you could set up a share, and then connect to yourself. Slightly more work to set up, but doable. One addendum: a network share looks like ... well, it looks like a network connection. Not all applications will, in fact, work across a network. SUBST, on the other hand, looks like a local disk drive. I have the same problem, but I used Partition Magic 8 to change the drive letter from I:\ to c:\. This was the worst thing I could have done (it was late at night & i was very tired - big mistake). Now my system won't boot up. My boot up is a dual raid0 system. I have a temporary IDE drive in place to boot from. My files were backed up, but I have an operating system with extensive programs and settings plus my windows XP pro setting anmd configurations, Netscape 8.0 Bookmarks, MS. Outlook email (& extensive calander notes etc) etc that I haven't been able to access. Can I edit the file from another WinXP Pro operating system? In your shoes I'd run partition magic to turn C: back into I:. I can think of no search/replace option that will get every possible place that the "I:" might have been placed. I can't do that from within that version of windows because it fails to boot up. I tried using an IDE HDD in a removable drive bay with WINXP & P/Magic installed and although it changed the drive letter on the raid set up back to C: in that operating system, I don't believe it could affect the settings within the WIN XP installed on the raid system which still refuses to boot as it has it's own uniqu settings. Fortunately, I found a ghost image I had of the raid0 drive which was several weeks old. I burnt this onto the raid and it worked, but of course my system and programs work as they did sveral weeks back and I am still in the position where I need to change my operating system path from I:\ to C:\ and at the same time have the disk recognised as a C:\ drive byt he operating system on the raid drive. Same exact problem (except my hard drive became "E:") - and my iPod was the application that was looking for the "c:" drive. Apple support gave me a Microsoft link with a regedit procedure to change the boot disc back to "c:", but everything I've read above says that may be a bad idea. I will try your fix and see if the iPOD will work with my pc. Thanks. - direct IE to use a directory on D: or E: for temporary internet files. I'd then clean off the old, respective equivalents on C: and see how much space that gets you. Sadly installing more software is likely to continue to fill up C:. Find the drive letter you want to change to (new). Look for "\DosDevices\D:" where the D: is the drive letter that is the current root and C: is missing. right click the field and rename. Change the D: to C: and close Regedit. Reboot and you are complete. in Windows 2000 you had to use regedit32 or something like that. My issues were that my Tape drives and/or Zip drives would be C: and the CDrom was D: because they were installed by factory in the primary slots. The HD on the Secondary string ended up being F:. I went into the "properties for my computer icon" and clicked Manage. Then disk management. Change the Zip and CDrom to other drive letters. Use the Regedit command above and then reboot. all is well after that. The other comments are inventive, but this is the straight Microsoft way to fix your drive letters. The two files that have comments are not required. However, if a person were to remove C:, all those files go away, causing Windows to be unable to boot. It just shouldnt be done, unless the user wants to try a repair or reinstall windows. Why make C: arbitrary when it should always be first, to avoid headache. None of the companies I work for install XP on any other drive, besides C:, unless its a dual boot situation. Please help. I recently XCOPY all of my existing software and windows setup from an old 60GB to a new SATA 160GB and removed the old drive. When I rebooted the system all seems ok, except that I acnnot load/run any programs they all are looking for drive C, which does not exist anymore. XP recognizes my new drive as DRV2_Vol(1) E, how do I change it to drive C? so I had this problem and I was stupid and did delete C and renamed F C. Of course now Windows won't boot but what do I do to fix it. Go ahead and laugh it up at my retardedness... It's been a long week and I just wanted to get AutoCad to run on my computer so I did have to go to the computer lab where I ended up anyways b/c I broke mine. The solution was so simple and it worked like a charm!!!!! This is the first time that I have been able to reslove any computer issues in less then 30 sec!!!!!!!!!!!! It solved my problem beautifully!! I can now connect and disconnect my backup ("C") drive with no impact on Yahoo Instant Messenger. Thanks for the tip!! I got this exact problem ... thing is I'd rather have a real C drive then a virtual one (don't like workarounds like this). I have a paragon partition manager which lets me change drive letters (and spends a lot of time doing so, so I imagine it changes all registry keys that point to the previous drive letter or something). Thing is it won't let me do it to the active drive. Is there really no way, even with the program to do this? ... I've tried booting from another partition but this partition shows itself as C when I'm in it (and when I'm on my primary partition it doesn't, strangely enough). how about computer security? does changing the "assumed" drive letter C to something else discourage a possible hacker? My problem is similar but not identical. When installing a new harddrive, it was designated F. I changed the designation successfully to C. Existing program files for software and data continues to want F. This includes MS Office programs and documents created using these programs. How do I change the addresses from F to C? I tried the virtual directory solution and it does not work. Hope you can help because this should be fixable since all data and programs are still on the hard drive (now called C as it should have been originally). My problem is similar but not I produced an image of my 20gig drive that was installed in my notebook and was C: to a USB drive that was assigned D: and now windows boots up to the login and when I attempt to login it immediatly logs back off. I think that the drive is still somehow identified as D:. How can I fix this problem? I tried this, but when i type in "subst C: \Virtual_C" part in Command Prompt, it keeps giving a "Invalid parameter - C:" responce..... any idea how to get past this? Hope but it does not work for me. I just bought a brand new PC. Now I frequently have the message : Insert a disk into the drive \Device\Harddisk1\DR3. Worst, when I launch the disk manager, I have an error : Cannot connect to logical disk manager. File not found. With your tip, I'm not allowed to assign the virtual drive to the C leter because it already exist. Why do I get an error message "Invalid parameter C:" when I tried the SUBST command? This sounds like it may help me, but I'm not sure. My situation is this...I installed a new hard drive that automatically became drive f. This new hard drive was assigned as the master and the old hard drive the slave by me. I formatted the new hard drive with the Windows XP disk. The old hard drive "c" gave up the ghost. When the "c" drive was working, everything functioned properly. Now that there is no longer a "c" drive, my system restore, search function, and Internet Explorer don't work. Do you think this virtual c may help my situation? Didn't help. Any help on which direction to go now would be appreciated. What is the correct solution to this man's problem? I have a similar problem.I have just formated my pc, and now when I insert a usb into the pc, in my computer it says invalid f which chould say removable f and show me the contents of my usb, when I click on it it tells me F is inaccesible and a long message. Can anyone help me out please? Thanks! That solved my problem! I ran into one little snag that I was able to figure out on my own, though. My computer had assigned "C" to a removable disk drive, which kept me from making a virtual C drive. So I just re-assigned the "C" drive to some other letter, and then I was able to create that virtual C drive. Anyway, thanks a bunch for your advice! SOLUTION FOR "Invalid parameter C:". 5. Computer Management window will open. 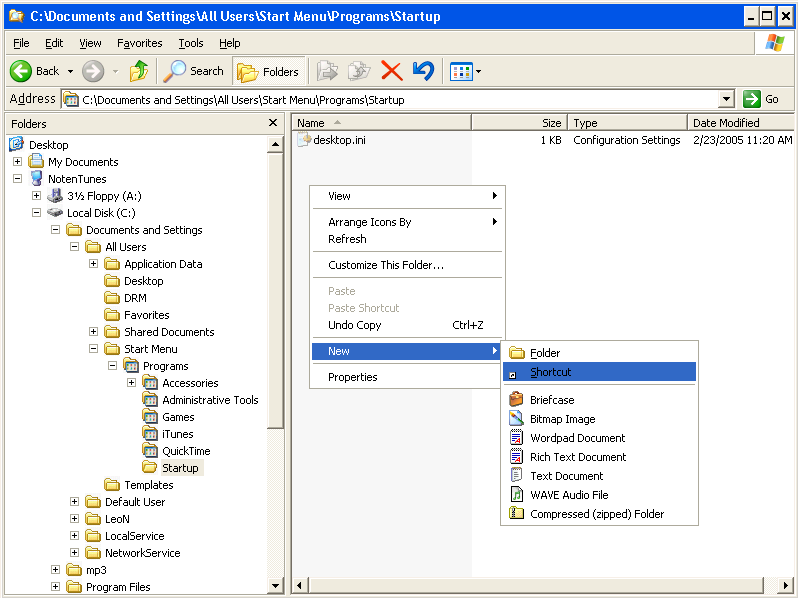 Click storage in the left page. My old system had two hard drives, both attached with a ribbon. Well, my boot drive died, so I got a new sata drive to replace it. The sata drive is far bigger than the ribbon drive that remains, so I installed Windows XP Home on it. Well, everything worked great, but the drive defaults to E: and the old ribbon drive is C:. Well, all of my games refer to E:, like they are supposed to, for install. But then when I try to run them they crash. I'm assuming because they can't find the C: drive path they need to work. So I have two questions: 1) Will creating this "Virtual C" help my problem? and 2) What do I do about the existing C: drive, since it reads as a System drive and windows won't let me change the path name of it. Why don't you just remove the failed drive? I got a little further with your outline above (the one with the screen shots)however, even though it starts to read the CD it stops and states: "The specified path it too long C:\Garmin"
It just asks if I want to cancel or retry. Retry does not work. "Windows can not modify the drive letter of your system volume or boot volume". Another way to alter the drive letter designation is to disconnect all drives except the one you wish to designate as 'C', this includes any other hard drive, usb, cd rom etc and not forgeting the printer and usb hub. Then clear the on-board memory by moving the clearRTC jumper to its alternate position for 5 - 10 seconds, return it to it's normal position and reboot with only the drive you've selected connected. The drive should now be designated 'C'. Shut down and re-connect all the other drives the system should now be as you wish. i have no c drive. and i have screen shoots that i took on disney pirates online game. how do i recover them. and get the sreen shots on my computer. i would like to see them. can you help me pls. Not sure what I am doing wrong, but I type in the first command in c-prompt and all works well, when I type in the subst command I keep getting an error message. Invalid parameter-C:, can you help? Make sure that you're typing it correctly as shown, and that you don't already have a C: drive. I have the same issue as Steve, I do have a C but it is 8megs and was created when I installed my new hard dive. Is there anything I can do? Similar issue as above. My machine has designated one of either the USB or memory card slots as C: Suggestions? Jason and Lucinda - this might help. My existing C: was just a USB drive. I went into XP and reassigned the drive letter so that I no longer had an existing C: (http://support.microsoft.com/kb/307844). Not a problem for me because I did not have any programs/data on that drive that the system would look for. I cannot find m c drive i went to my computer because Im trying to do the disk check clean up and defragmenting but theres no spcae that says its the c drive wat do i do. In my case, my usb multi card reader was the problem. When I installed XP64 it took drive C: as H: and the multi card reader managed to get the C:, but if they aren't connected its fine. I right clicked the icon next to the clock, "safely removed" the device and then proceeded with the instructions above. Tried to create the virtual C using the command prompt, but my machine already has a C drive but it is listed as a removable. What else can I try? I am having this same problem. I am using the USB dongle for Internet. from the last 2 days, i have been getting this message "there is no disk in the drive. please insert a disk into drive \device\hardisk1" whenever i plug in the USB. Now when i go to Disk Management and tried to disable the USB, it is working fine. Though I am using the net, but what the hell is this? omg..that was awesome! I tried to d/l a virus protection and it kept failing because it couldn't find C. For some reason, person who I had re-format my drive due to previous virus, loaded XP pro and gave me E: as harddrive. Your solution worked. You saved me all kinds of grief with this tip. I was finally able to load a software program that insisted on looking for drive C. It allowed me to get to the point at which I could change the installation drive to F. Before your tip it wouldn't let me get to that point, telling me I had an invalid drive C. Thanks! We have this problem on a customer's machine where they have H:\ as their primary drive, which is a removable USB machine. Disk Managment shows but it, and a C: drive that is, present, removable, read-only and has no space. SUBST command fails with the drive letter already used. However, references to C:\ from DOS fail. All under XP--so rights are not the issue. Perhaps this is a device driver for bootstrap purposes? I am afraid to change the C: drive letter to D: or E: (both free) for fear of rendering the machine unbootable? Any perspective or ideas come to mine? I have the same problem and was considering using a product like partition master to create a new "C" partition. Would this solve the problem or create new ones? Thanks in advance for your help. I suspect that it would be about as safe as anything I've outlined in the article above. Ultimately the safest thing to do of course is to install window such that it shows C: as the system drive to begin with. Just finished with 4 hours on phone with MS Tech Supp. They have no answer for the problem. Running Win 7 Pro. My problem started when the maker of the PC used a C drive with only 40 gigs and it ran out of room. used Norton Ghost which came with new Samsung SSD that I installed to image C: drive to new drive. Samsung says to use the letter Ghost selects so it became G:. but MS Tech couldn't change the C drive letter without causing problems. Finally the MS Tech gave up. Leo says "Ultimately the safest thing to do of course is to install window such that it shows C: as the system drive to begin with." But HOW. My main drive is on F: after a reinstall of XP and I don't remember having any involvement in the choice of drive letter.